The Blue Engine String Quartet was formed in 1997 as the core ensemble of the Nova Scotia chamber music series, Blue Engine Music. The Quartet are all members of Symphony Nova Scotia. Blue Engine holds true to classical roots performing many of the masterworks of the string quartet repertoire, including twentieth century landmarks by Ravel, Shostakovich, and Arvo Pärt. The Quartet has worked closely with important Canadian composers Christos Hatzis, Peter Togni, Tony Genge and Brian Current. In September 2006, the Quartet premiered Brian Current’s “Faster Still” with Duo Concertante in St. John’s, Newfoundland. This work was commissioned by the CBC especially for this collaboration and the concert was broadcast nationally on CBC Radio’s “Two New Hours” and “In Performance”. The members of the BESQ are proud to champion works by women composers: Amy Beach, Fanny Mendelssohn, Rebecca Clarke and Germaine Tailleferre among them. An important part of Blue Engine’s mandate is to provide audiences with innovative concert experiences. The 2003 “Lost Composers” concert received national attention: it was an emotionally charged evening- an overflow Pier 21 audience heard premieres of works that were repressed or hidden away during the Holocaust. The Blue Engine String Quartet is frequently broadcast on CBC Radio, appears on CBC Television, and was featured, along with four distinguished guest singers in “Quartet Plus Four at Christmas”, a New Scotland Productions Christmas Special for Vision TV and CBC. They were also featured in a BBC documentary film on the life of the late Dudley Moore, in which they perform Moore’s one and only string quartet written during his Oxford years. Halifax has one of this country’s most vibrant popular music scenes, and the Quartet are frequently featured as guest artists on recordings by the likes of Jill Barber, Meaghan Smith, Mary Jane Lamond, Heavy Blinkers, Chucky Danger and Jenn Grant. 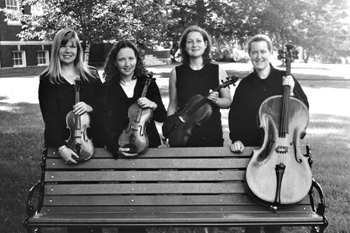 The Blue Engine String Quartet loves to collaborate with other chamber musicians. They’ve had the pleasure of making music with many of our finest classical artists: among them, Denise Djokic, Philippe Djokic, Lynn Stodola, Peter Togni, Walter Delahunt, Sanctuary, Marcia Swanston, Peter Allen, Margaret Isaacs, Suzanne Lemieux and Bernhard Gueller (as cellist). On the night of the 2006 Juno Awards Gala Broadcast, Jennifer, Anne, Margot, and Hilary were the envy of every woman in Canada when they got up close with heart throb Michael Bublé, accompanying the international star on his massive hit single “Home”. The Quartet is happy to report that he’s a really nice guy! In 2005, after years of playing on other artists’ records, Blue Engine along with singer Cliff Le Jeune and pianist Paul Simons released their own CD, “If It Be Your Will…Songs of Leonard Cohen”, a fifteen song collection of exciting new arrangements by fellow SNS musician Chris Palmer. The CD received rave reviews including one from Leonard Cohen himself who wrote to Le Jeune, Simons and the Quartet: “Dear Colleagues, Thank you for this sublime gift.” The Cohen show has played to a huge audience at the Indian River Festival, had a successful Maritime Tour in the spring of 2007, a week long run at the exquisite Chester Playhouse, and a well-received benefit appearance in Hamilton, Ontario. In February 2007, along with Cliff Le Jeune, the Blue Engine String Quartet had the privilege of performing for the Governor General, Her Excellency Michaelle Jean, and His Excellency, Jean-Daniel Lafond, at a private function. Her Excellency has requested that Cliff, Jennifer, Anne, Margot, Hilary and Paul give a State Concert at Rideau Hall. We've had many amazing years together in which we’ve had the privilege of performing some of the most beautiful and diverse music in the repertoire, staged several world premieres, and collaborated with some of Canada's greatest musicians. Ten years go by quickly, especially when you are having fun, surrounded by friends. We really are glad that we listened when we heard a certain Little Blue Engine say “I think I can...I think I can”.